to the Gustav Fröhlich Fan Page! You've found the only site on the ENTIRE internet dedicated solely to the great German film actor Gustav Fröhlich, the star of Fritz Lang's Metropolis and over 100 other films from the silent era to the 1980's. Hopefully if your as big a fan as I am you'll find just what your looking for right here, including tons of facts, films, links, pics, AND MORE PICS!!! Gustav Fröhlich was born on March 21, 1902 in Hannover, Germany and he grew up by foster parents. His father was an engineer, and his family moved around western Germany a lot while he was growing up, living in cities like Wiesbaden and Wurzburg. In 1916/17 he volunteered for the press surveillance in the occupied Belgium city of Brussels. He first started his career as an editor, but also spent his spare time doing local theatre shows. He also wrote two dime novels (Heinz Brandt, der Fremdenlegionär). His debut in film was in the role of "Franz Liszt" in the picture "Paganini" (1922). His most famous film role as "Freder" in the famous silent film Metropolis came about by chance. He was discovered by Thea Von Harbou, Fritz Lang's wife, working on the set of Metropolis, and she immediatly cast him in the lead as Freder because of his striking good looks. 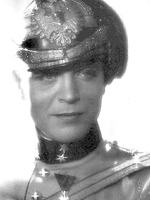 In 1930 Gustav Fröhlich was engaged to Hollywood by Warner Bros. to do German versions of American movies: "Die heilige Flamme" (1930) and "Kismet" (1931). 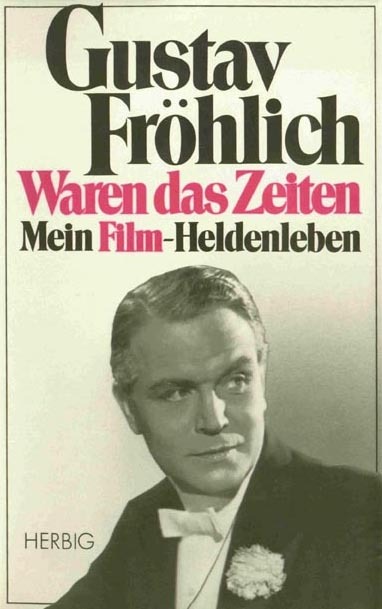 He also did the direction for "Rakoczy-Marsch" (1933), "Abenteuer eines jungen Herrn in Polen" (1934), "Wege im Zwielicht" (47), "Der Bagnosträfling" (49) and "Die Lüge" (50). His first marriage was to the Hungarian Opera star Gitta Alpar, but it only lasted from 1931-1935. He then lived together with the Czech actress Lida Baarova from 1936-1938. When he lost her to the Nazi Propaganda-Minister Joseph Goebbels, Fröhlich had a fierce verbal dispute with Goebbels - that he had slapped Goebbels went round as a rumour. In 1941 he got remarried to Maria Hajek. In the same year he had to serve for the Wehrmacht (Armed forces) Landschützen-Regiment, interrupted by some movie engagements. From the Sixties to the Eighties he had only a few entrances in the movie business - "Und keiner schämte sich" (60), "Der neue Talar" (61), "Die Dubarry" (63), "Laubenkolonie" (68), "Der lachende Apfel" (76), "Pommi Stern" (81), and "Die Laurents" (81). His last public appearance was in 1986, when Giorgio Moroder presented his revised version of Metropolis. He died after an operation in Lugano, Switzerland on December 22, 1987. "Waren das Zeiten - Mein Film-Heldenleben"
Here are pictures of the front and back covers! 2 Weg zum Licht, Der (1923) ? 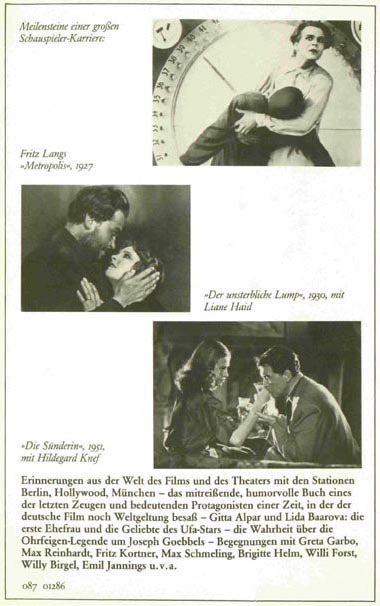 16 Schwere Jungens- Leichte Madchen (1927) Martin Overbeck Jr.
22 Eva and the Grasshopper (1929) ? 68 Frau Sixta (1938) Markus, Major a. D.
76 Sechs Tage Heimaturlaub (1940) ? 88 *Leb Wohl Christina (1945) ? 111 Der Neue Talar (TV Film) (1961) ? 112 Die Dubarry (TV Film) (1963) ? 113 Kriminalmuseum - Die Frau im Nerz (TV Film) (1963) ? 114 Laubenkolonie (TV Play) (1968) ? 115 Der Lachende Apfel (TV Play) (1976) ? 116 Schicht in Weiss (1976) ? 117 Peter Alexander: Wir Gratulieren (TV Show) (1979) ? 118 Pommi Stern (TV Film) (1981) ? 119 Die Laurents (Television Series) (1981) ? 120 Die Schonsten Melodien Der Welt (TV Show) (1982) ? 121 Komodianten. Szenen Aus Dem Lachkabinett des Deutschen Films (TV Film) (1982) ? He lived in Locarno, Italy at one time. He married the famous Hungarian opera singer Gitta Alpar in 1932. He had one daughter with Gitta Alpar named Julika. He married again in 1940 to Maria Hajek. Click here to view a collection of random Gustav photos. or if you are just as big of a Gustav Fröhlich fan as I am, PLEASE E-MAIL ME! Or better yet, sign my GUESTBOOK and let me know you stopped by! You are Gustav Frohlich fan # to stop by this site since May 1, 1998. This site was last updated on August 18, 2006.